Fall spice meets huge smoothie bowls today friends. If you’re a fan of cinnamon spiced treats or creamy, thick, and naturally sweet smoothies, this recipe is for you. 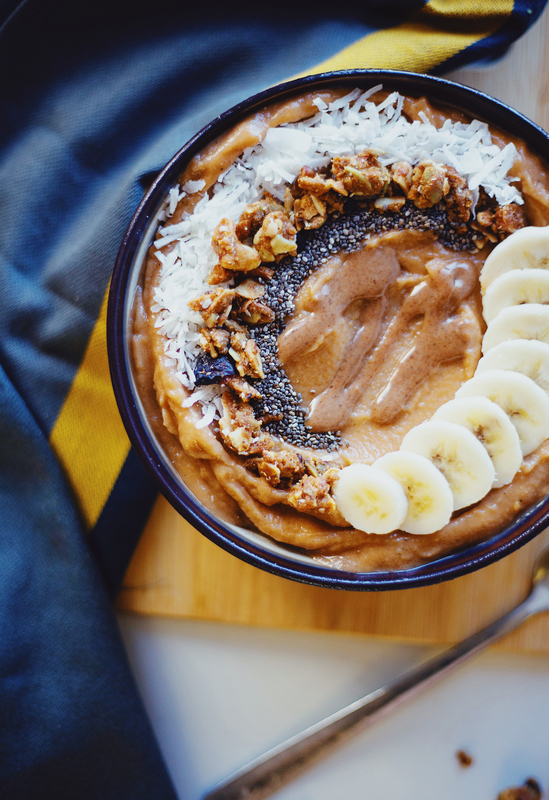 Let’s make a big spiced sweet potato smoothie bowl! A year ago I discovered the wonder of putting sweet potatoes in smoothies. Slowly but surely this discovery transformed into different types of bowls (like my mint chocolate smoothie, golden milk smoothie bowl, and coconut matcha smoothie bowl) and is now my go-to. Frozen, blended sweet potatoes are the ultimate treat. 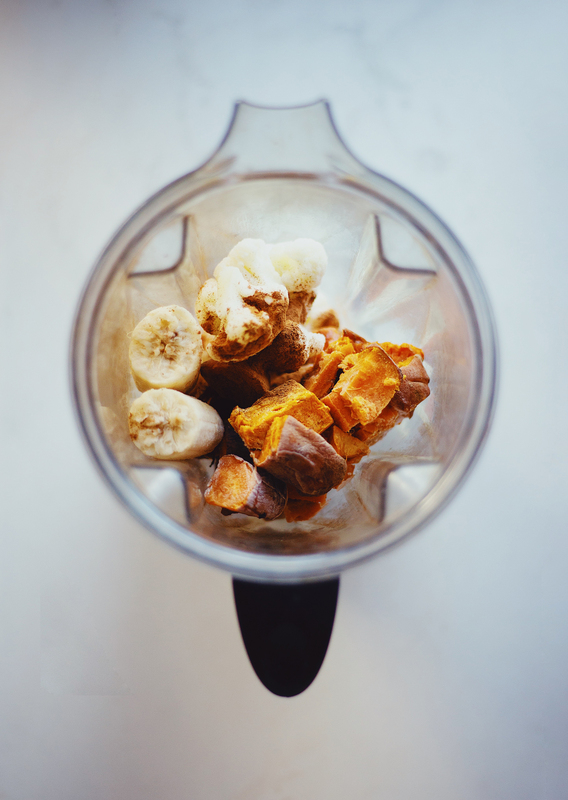 Top them off with some extra superfoods and you’ve got yourself more than just a smoothie—you’ve got yourself a loaded smoothie meal. 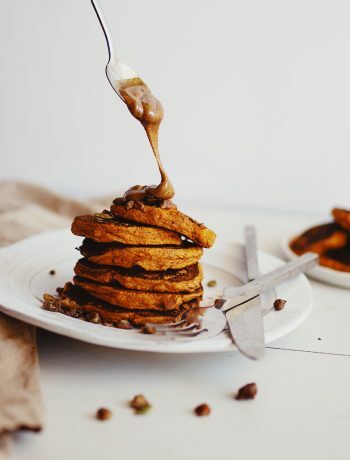 Along with the sweet potato, I add frozen banana (for extra sweetness), frozen cauliflower (for extra volume & nutrients), nut butter (for protein), a date (for a bit of caramel flavor), pumpkin pie spice (for that taste of fall), and just a bit of almond milk (so it blends nice a smooth). 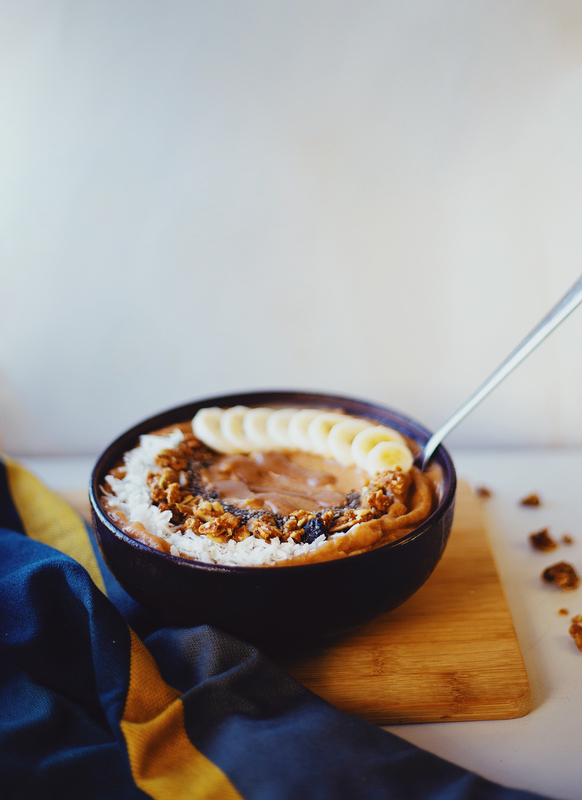 This combo creates the perfect naturally gluten free and vegan autumn spiced smoothie bowl. 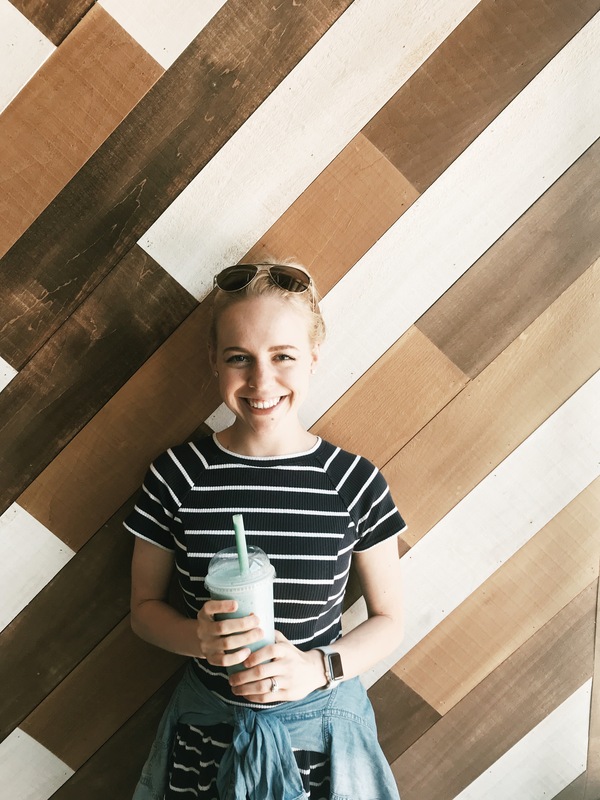 This smoothie would pair great with my gluten free zucchini bread muffins for a big brunch (you can divide this recipe into smaller portions if you’re serving it with other treats!). I topped my bowl with Paleoanola (see notes section for more details), but it would also taste great with my homemade granola recipe! 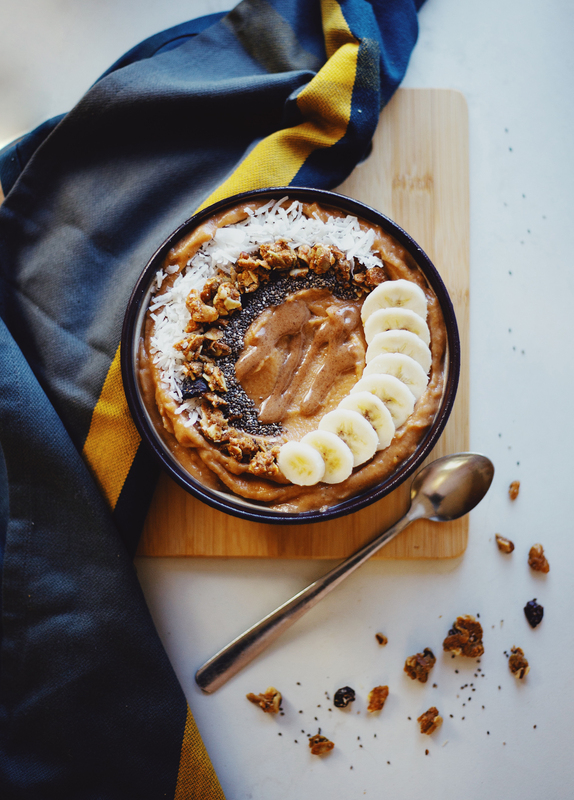 If you like this recipe you might also like my sweetheart smoothie bowl, almond chai smoothie bowl, sweet potato maca overnight oats, or sweet potato walnut brownies. If you’re a fan of cinnamon spiced treats or creamy, thick, and naturally sweet smoothies, this recipe is for you. My spiced sweet potato smoothie bowl is the perfect, healthy, fall treat for all the smoothie lovers out there. Scrape into bowl, sprinkle with toppings if desired and serve immediately. *Depending on the strength of your blender and smoothie thickness preference you may need to add more milk. **I used Paleonola’s grain-free Pumpkin Pie granola. I always reccomend either making your own granola or purchasing granola made with whole food ingredients and natural sweeteners. It is good to avoid granola high in sugar, made with corn syrup, canola oil, or other fillers. 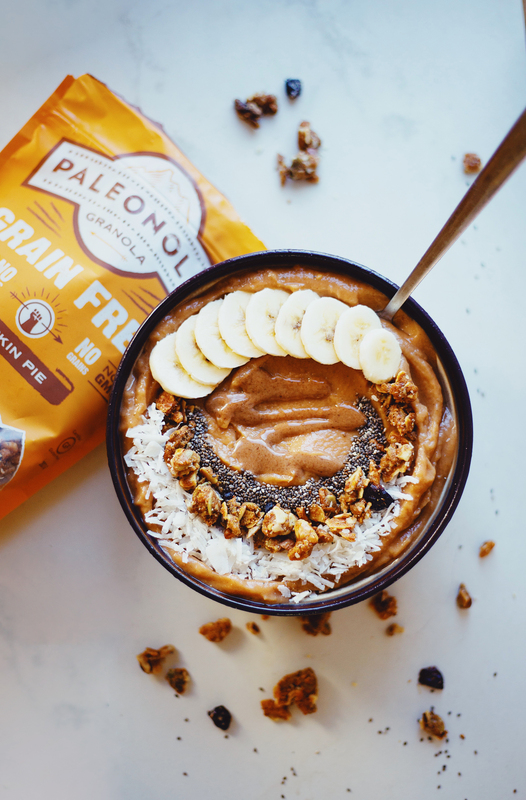 I love Paleonola’s products because they are primarily made up of hearty nuts and seeds—which promote sustained energy with the same feel as traditional granola. Plus they are gluten free and taste incredible! There are so many great granola options on the market now that it is worth purchasing the real granola rather than the sugary stuff that does not support your body. 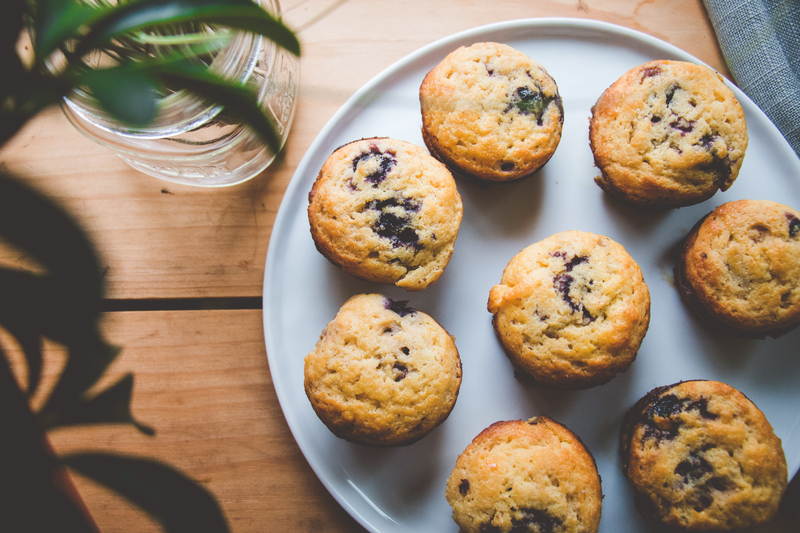 It is also important to note that if you are eating gluten free, be sure to look for granola only certified gf! 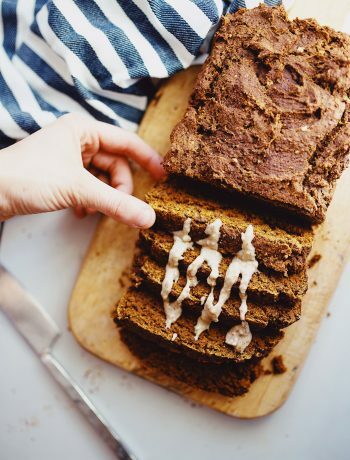 This looks delicious and perfect for a cozy morning! I’m going to try this soon.